Over the Christmas holidays I was faced with quite the dilemma… to invest in new pots and pans or not. Canadian Tire was having an incredible sale on their Lagostina cookware. Not just their regular stainless steel pots and pans though, it was their Lagostina Euro-clad Elite Series Copper Cookware 12-piece set. Gorgeous, heavy-gauge 3-ply copper base and body with stainless steel lids, riveted handles that are ergonomically designed and can be used on all surfaces except for induction. One of my sisters was fortunate to receive a set for Christmas which was why I even knew about them. We took them out of the box, stripped away the plastic and wiped off any styrofoam bits clinging to their sides. We matched the lids to the pots and lined them up on the counter… shiny, bright and new (drool). Yes, I had cookware envy. Dazzled by their beauty, I was coveting my sister’s new cookware. Now this is a 12-piece set of cookware that can really put a BIG dent in your pocket book. At Canadian Tire the set sells for (choke…cough) $1,699.99 Cnd… and that’s BEFORE you add the 13% sales tax… BUT… it was on sale for an incredible price of only $499.99 !! A steal of a deal really. Unfortunately, the box was too big to carry home on the train but I was planning on heading to the nearest store once I got back from spending Christmas with the family. We actually used one of the pots to make the gravy for our Christmas dinner and they really do perform well. After dinner was done and the cleanup began, I reached for the pot with the gravy in it and it was still very hot. Hot enough to burn your tongue! This is after the burner was turned off and the gravy sitting in the pot for a good hour or more. So we know the pots really hold the heat. They heat up quickly, evenly and maintain the heat for quite a while. I WANT A SET!!! I arrived home and decided that I would head to the store the next day. Saturday arrives and I went on line to check if there was stock at a location closest to me and to my surprise ~ the sale was OVER!! Well, I was struggling with the decision of replacing my laptop or buying cookware and I guess the decision was made… I needed the laptop more than I wanted the pots (almost), so laptop it was. I could wait until next Christmas, or later in the year, when they would likely go on sale again. I could plan to get them later. I really didn’t NEED new pots… I just WANT them because they’re so pretty. Truth be told, I have owned my current set of pots for more than 10 years so, I could rationalize replacing them. I wouldn’t give up my Le Creuset cast iron enamelled pots, or my Paderno paella pan (a gift from my sister)… but the rest of them ~ sure, why not!? And then it happened… the following week, they were once again on sale for $499.99. I could do this. I could manage to get them and donate my old cookware to a good home. Yeah, I could do this! I checked the store listing for the locations nearest me and as luck would have it, they had 3 in stock. Fine..that settles it… I’m going to go and get myself a set. It was meant to be. So I head to the store and even though their online status showed they had some in stock ~ the shelf was empty! After 20 minutes, it was determined that they were indeed out of stock… BUT… they are available at another location. I headed to the next nearest location, determined to bring a set home with me that day. And there it was… one box left on the shelf! Yes, they are very, very pretty. Shiny copper with silver lids and handles. They are going to look beautiful in my kitchen as I prepare a new recipe this weekend. I could not wait to get them home. I could envision them in my kitchen, how they would look on my stove, what special recipe I would create. I put the box in my shopping cart and started to make my way to the cashier lineup. And then I heard it… to buy or not to buy? Hesitation started to set in. Do I really neeeed these or do I just waaaaant them? Should I actually buy them now, or hold off until later in the year? If I’m meant to have them, they will go on sale again later in the year, right? I was sure of that because they had gone on sale twice already. But they’re so pretty, and shiny, and… and….. aaaah crap!! Instead of turning my cart to the right to head to the cash registers, I turned to the left and headed back to the cookware department where I put the box … back…. on…. the…. shelf…. (heavy sigh). Yes, that’s right. After all of that running around and hunting for my prize. Having it in my hands, in my shopping cart and on my way to pay for them. I decided to be “fiscally responsible” and NOT buy them. I know… it was a crazy move but I did it and actually felt good the more distance I placed between the store and my pocketbook (another heavy sigh!!!!). I did not go home empty handed though. As a reward, I went to the grocery store and picked up some very nice scallops and treated myself for not being blinded by those gorgeous pots and talking myself into buying them because they were such an amazing deal. The results of that day was a tasty meal…. 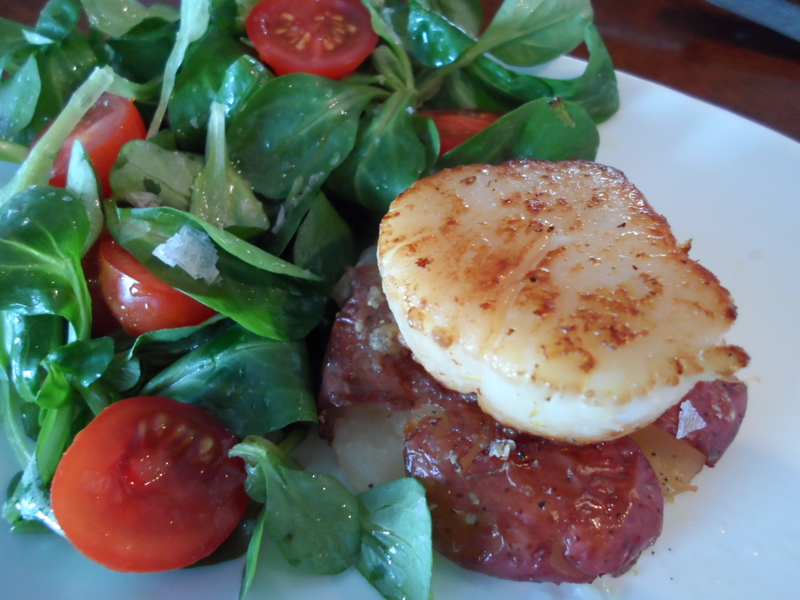 seared scallops on smashed baby potatoes with a mâché salad. Easier to digest than the cost of the cookware. My sister has since given her review on them and they are, as I suspected…. AMAAAAAZING!! I will have them though…. some day … I WILL have them!!! NOTE: Keep your eyes peeled for the Canadian Tire flyer as these pots have gone on sale several times this year. Did I finally buy a set?….. YEEEEESSSS!! Check out my post on how to care for them Caring for Your Copper Cookware. Posted in productsTagged Canadian Tire, cookware, cookware sales, Lagostina, Le Creuset, Paderno, pots and pans, scallopsBookmark the permalink. Thank you for your comment and link Amie. I absolutely love the copper pots that I finally purchased. I’m sure the stainless steel set that you included the link to is also amazing and less work to maintain since the copper set does need more polishing. I think that the stainless steel set would be a great set to start with if the copper set is too pricey to invest in. I have my eye on the pounded copper set but have been able to resist…. so far! Lagostina is such a top quality product that I don’t think you could go wrong with this set. It’s beautiful, has a heavy bottom which will conduct heat very well and it will have lower maintenance than the copper set. If you live in Canada, I would wait for them to go on sale at Canadian Tire though. It’s a steal of a deal. Let me know how you enjoy cooking with them. Cheers!! I just got the 12 piece set from Canadian Tire today on the “as is” table….I only paid $90 because they had been returned do to a little spot of discoloration on one pot…you can’t even see it!. Everything still had the tags on them and were in the box all wrapped in their plastic etc. 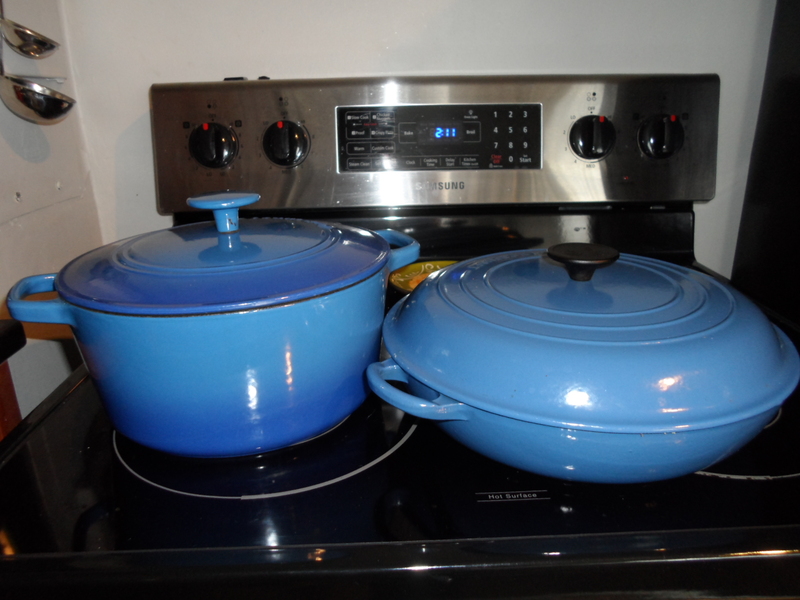 Absolutely nothing wrong with them…talk about being at the right place at the right time….I had no trouble making this buying decision, we had the same pot set since we first moved out together 16 years ago. I just washed them all and put them away I am anxious to try them out. You are going to absolutely LOVE them. What amazing luck to get them at such an incredible deal. If I saw a set priced that low, I would definitely snag a second set for myself. Enjoy!! Hi, looking for a set. A few reviews at Canadian tire suggested the copper is very thin and started to wear off or discolour quickly. Can you confirm that 4 years later, they are still in good shape? Thank you for contacting me. I use my copper pots almost everyday and yes, they do discolour but that is normal and the first scratch I got on mine was a real heart breaker. Copper pots will never have that fresh out of the box shine unless you are polishing them every day and if you polish them with something very abrasive then, yes, you will wear the copper. If you don’t dry them immediately after you wash them, then they will have water spots. They are more high maintenance but, in my opinion, so worth the investment and this set is amazing to cook with. I usually polish mine maybe once a month (sometimes longer) but I don’t mind the marks on them. That’s part of the charm of copper pots. One thing NEVER to do is put them in your dishwasher… that’s a big NO NO. Thanks! Like you indicated, they are about $400 at CT marked down from $2000. Do you think this is still a good deal today, or have other technologies made them obsolete? If you had to choose today (pretend they got stolen or something), would you buy them again? Are their other newer brands or technologies that would make you try something else? Yes, I still think they are a great deal and would buy them again. I also like the Lagostina hand hammered copper set but keeping that set clean might need a bit more elbow grease. If I was to buy a different set they would likely cost a lot more. I really haven’t taken the time to check out other brands or technologies because I am really very happy with this set.